Providence Academy Word | Shall I Compare Thee to a Pumpkin Spice Latte? Shall I Compare Thee to a Pumpkin Spice Latte? Coffeehouse has been a tradition at Providence Academy for a good many years. This biannual showcase features the many musical talents in the upper school at PA. With the visiting Netters as the Emcees, coffeehouse is a relaxed and enjoyable Friday evening that is beloved by not only the upper schoolers, but rather the entire PA community. Unfortunately, one thing coffeehouse lacks is actual coffee. Concessions include Coke products and water, but the warm caffeinated nectar hasn’t been a featured treat for several years now. The 2018 spring coffeehouse notably featured root beer floats, but coffee has never made the lineup. In order to make up for the lack of coffee, the performers each make their own unique flavor on the stage with their vibrant and versatile acts. It’s fitting, seeing as holiday flavored coffees often hit the market right around the same time as the much anticipated coffeehouse. 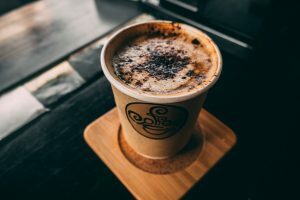 And now, for the first time ever, the PAW will offer a definitive look into the fall coffeehouse accompanied by comparisons to some of the most beloved holiday coffee drinks as well as some year round favorites. Everyone knows and loves the PA jazz band as the opening act of the coffeehouses. This talented group of symphonic band honors students is directed by Mr. Jones. Last Friday, the jazz band exhibited their Christmas piece early with Big Band Holiday, thus earning the comparison to the Gingerbread Latte; like Big Band Holiday music, the Gingerbread Latte is a warm, comforting classic with a spicy twist. A coffeehouse veteran, Jack Kruse (‘19) is no stranger to the stage. Performing solo acts for the past three years, his singing and guitar playing have become one of the staples of coffeehouse. His talent on both guitar and vocals has even led some audience members to believe that he deserves the Golden Buzzer on America’s Got Talent. With his warm sound, earnest demeanor, and soulful singing, mixed with his undeniable talent, Jack’s spot on the Coffeehouse Lineup fits the ever-popular Turtle Mocha from Caribou, which contains all of those qualities and many more with its complex layers of chocolate and caramel balanced evenly with coffee. Another guitarist, though not a vocalist, Shane Flanigan (‘20) blew the audience away once again with his adrenaline pumping guitar solo. “He looks at Guitar Hero and he’s like ‘Oh, that’s cute’,” band director Mr. Jones enthused. His intense and heart pounding talent contrasting sharply his cool and collected demeanor has earned him a place on the Lineup as not a holiday classic, but rather a different concoction of his own invention. “I’d probably compare [my act] to a Trenta Cold Brew from Starbucks with extra ice, four shots of espresso, and nothing else,” he explained. This mix of intense caffeine with a cool and collected demeanor is right on the mark for Providence Academy’s house rockstar. One of the three debuting acts, Carole Levoir (‘19) made a large splash in the coffeehouse world with her solo of “Sweet Creature”. Often seen in the crowd, Carole was proud to make her first ever stage appearance, and also earned her spot in the Lineup as the Caramel High Rise Latte: sweet, with a hint of salt for flavor, but overall warm and comforting all the same. This drink in particular suits Carole’s act because it was the first drink that she ever got from Caribou, and this was her first time doing coffeehouse. “That’s a really odd coincidence, actually,” Carole admitted when she found out. Coincidence or not, both the Caramel High Rise and Carole have found a place not only in the lineup, but also in audience’s hearts. You may have seen her in the choir concerts as a featured soloist, or remember her as the Sour Kangaroo from Seussical or Sister Bertha from Sound Of Music, but Isabella Igbanugo’s (‘19) talent goes far beyond that. With her deep, soulful voice, Isabella has made a name for herself in the world of coffeehouse as both a soloist and a featured singer on jazz band pieces, creating a whole new standard for the acts. Her rich and resonant sound has earned her a suitable comparison to the Dark Chocolate Mocha: deep and flavorful chocolate mixed with a strong brew of coffee to create an incomparable drink that will flood your senses with intense emotion, a lot like Isabella’s singing. Another newcomer to the Coffeehouse stage, Stephanie Momanyi (‘21) brought the house down with her heartfelt rendition of “Always Remember us This Way”. Notably the youngest performer in the lineup, Stephanie gave a thrilling debut performance with the poise of someone far more experienced and mature. Her sweet singing mixed with a spicy performance may remind future audiences, as it reminded us, of the Cinnamon Dolce Latte; rich in flavor and a memorable favorite that won’t be going anywhere any time soon. Another veteran, Gianna Bruno (‘19) ascends the stage once again for a riveting and moving solo. Often accompanying herself on electric bass or piano, and even premiering one of her own original works at the 2018 Spring Coffeehouse, Gianna’s versatility has made her one of the most compelling performers in the lineup. The drink that compares best with this amazing amount of talent would have to be the Vanilla Bean Creme Frappuccino, seeing as it’s an irreplaceable classic, but it also gives a nod to Gianna’s bilingual performance in which she switched from French to English singing with the ease of a native French speaker. The last of the three debut acts, Carson Kreger (‘19) mounted the stage for a memorable solo of “Sunflower”. Often seen behind the scenes in the theatre business as the dependable stage manager for the PA Players, Carson was happily welcomed to the spotlight for her first ever stage appearance. With her comforting and sweet song, Carson earns her place in the lineup as the classic Chai Latte; a warm, dependable favorite of many people during the holiday season. One of two duet acts, siblings Maddy (‘20) and Sam (‘19) Young captivated the audience with their rendition of “Shallow” from the new movie A Star is Born. Their natural harmonies and sibling connection warmed the audience’s hearts and earned them a place on the lineup as the Candy Cane Mocha with a side of Chocolate Chip cookies; a perfect comfort food combination that is not only timeless, but also captures the essence of this dynamic duo right on point just in time for the holidays. The second of the two duets and the final comparison for this Lineup was Ikemoso Ayika and Cort Dingman (both ‘20). While both did a solo act, the two will perhaps be remembered best for their duet of Billy Joel’s “Piano Man” with Cort on piano and Ikemonso on vocals. With their almost bantering stage presence and affable voices, Cort and Ikemonso finish off the Lineup with the ever popular Tuxedo hot chocolate from Dunn Brothers. With its lighthearted taste topped with that ever important dollop of whipped cream, the Tuxedo hot chocolate is perfect for this duo of friends who really are indeed the piano men. So drink up, enjoy the holidays, and be sure to catch the video coverage of the coffeehouse, which can be found on the Providence Youtube Channel.